I love lifting heavy things. Picking up a heavy dumbbell or barbell in the gym gives me a sense of accomplishment. This love didn’t until later on in my life. Before I started CrossFit, I was a gym bunny, taking 7-9 exercise classes a week including zumba, Krav Maga, body pump, spinning, kickboxing, step aerobics and boot camp classes. I really enjoyed the body pump classes (an hour long strength training class focusing on different body parts for 2-3 minutes using light dumbbells and barbells), but never felt like I was getting any stronger. I joined CrossFit back in 2011 after I moved to Oklahoma, nervous and excited but ready for a new challenge. Fast forward over 3 years later, and know I can’t imagine a week without picking heavy things up and putting them back down. Back squats are my all time favorite strength training movement, with front squats a close second (and dead lifts dead last on that list. Get it? Deadlifts? dead last? Okay, stop groaning, did you at least crack a smile?). It’s also great to hang out with other women (and men) who are care about lifting heavy too! The sense of camaraderie at gym is great, and sometimes I get just as excited about watching my friends reach their strength training goals as I do when I reach my own. 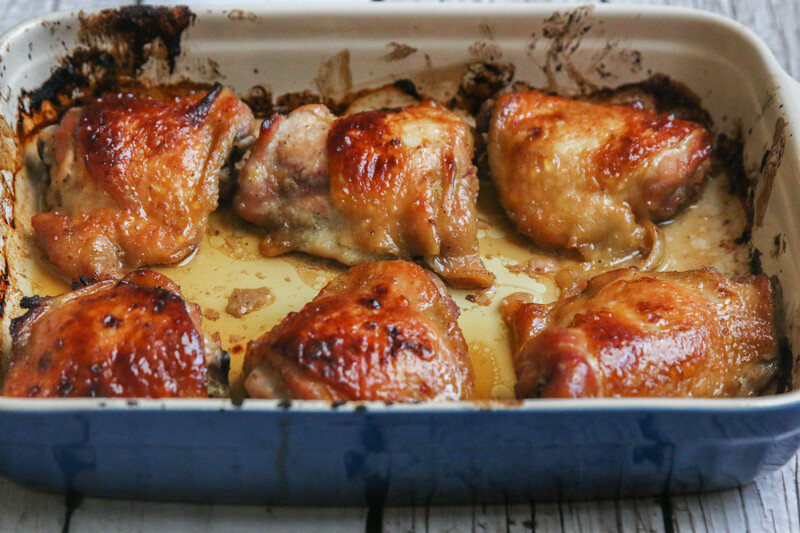 These same friends help me taste test recipes for the blog, and my taste testers have given these Orange Honey “Soy” Chicken thighs two thumbs up! The marinade for this chicken is a balance of sweetness from the honey and saltiness from the coconut aminos (the “soy” part of the recipe) and salt. The addition of fresh grated ginger and minced garlic add a level of flavor that is sure to please your taste buds. Enjoy! I love reading your reviews of the recipe after you’ve tried it. Please leave a comment below sharing your results. Place all of the ingredients except for the chicken in a medium size bowl, and stir to combine. Place the chicken wings in a large resealable bag. Pour the marinade mixture over the chicken thighs to coat and then seal the bag tightly (making sure to remove as much of the air from the bag as possible before sealing). Refrigerate the marinated chicken thighs for 4-6 hours (can refrigerate overnight). To cook the chicken, preheat the oven to 425 degrees. 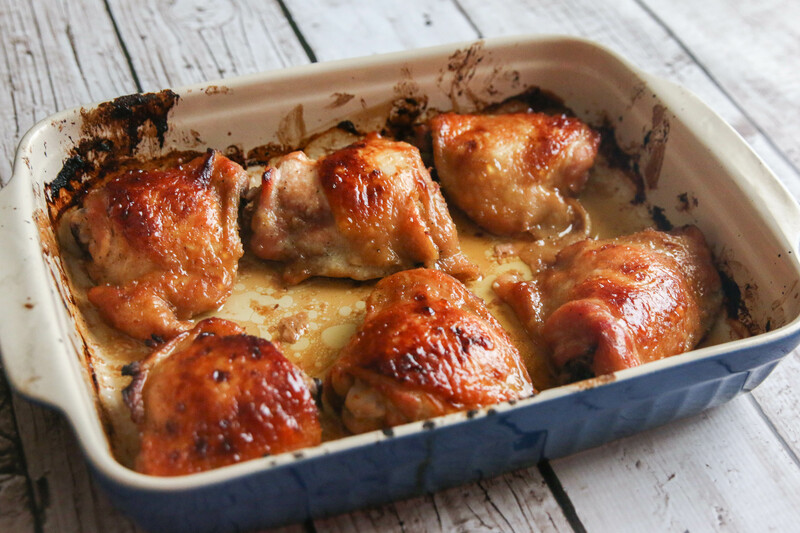 using a 9 x 13 baking dish, place the chicken thighs skin side down in the dish (make sure to remove excess marinade from the chicken thighs before placing in the baking dish). 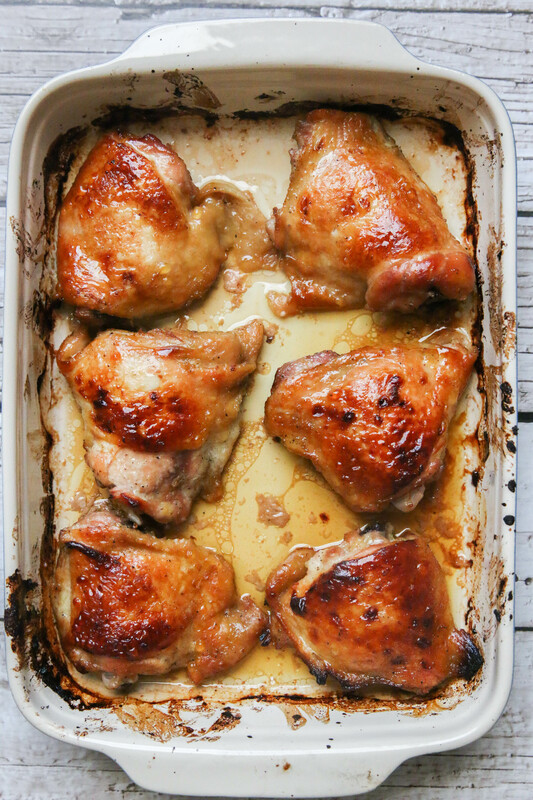 Bake the chicken thighs in the oven for 20 minutes. After 20 minutes, remove the chicken from the oven, flip over so that the skin side is up, and place back in the oven. Continue cooking until chicken thighs are done, approximately 25-30 more minutes (bake until the internal temperature of the chicken thighs is approximately 185 degrees). Tags: chicken marinade, chicken thighs, dinner ideas, glutenfree, grainfree, paleo, Primal | Permalink.